With the current healthcare climate in the US, health insurance companies like Cigna are trying to get closer to their customers. Consumers have little transparency into the cost of services. And in most cases employers purchase insurance products, which gives consumers less choice and health insurance companies less control over the consumer's experience with their products. Consumers often end up with a very negative perception of payers and their motives. How can Cigna move from a "payer-centric" model to a "whole healthcare experience lifestyle-centric" model? To identify opportunities in the open-ended problem space, we conducted interviews or card sorts with 12 participants to hear about what they love and hate about the healthcare system and how their interactions with it shaped their perceptions. 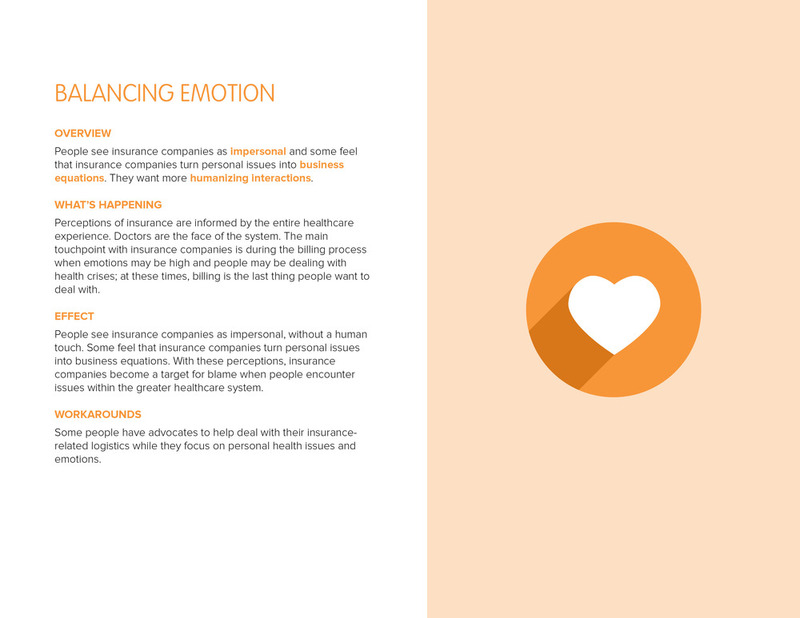 We came out with 79 insights that we clustered in to 3 larger themes. Click through the themes, some important insights, and our resulting design principles below. 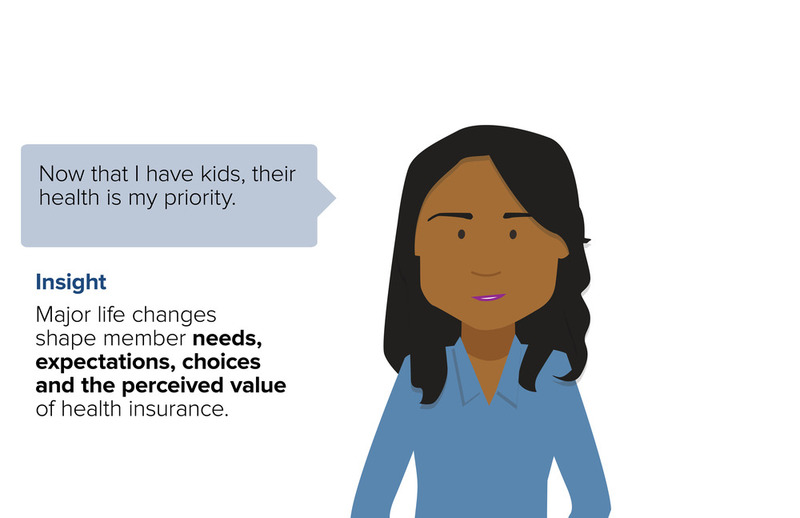 Using these insights and design principles as a basis for solutions, we found the biggest opportunity areas for Cigna by looking beyond the 5 interaction points we started with. 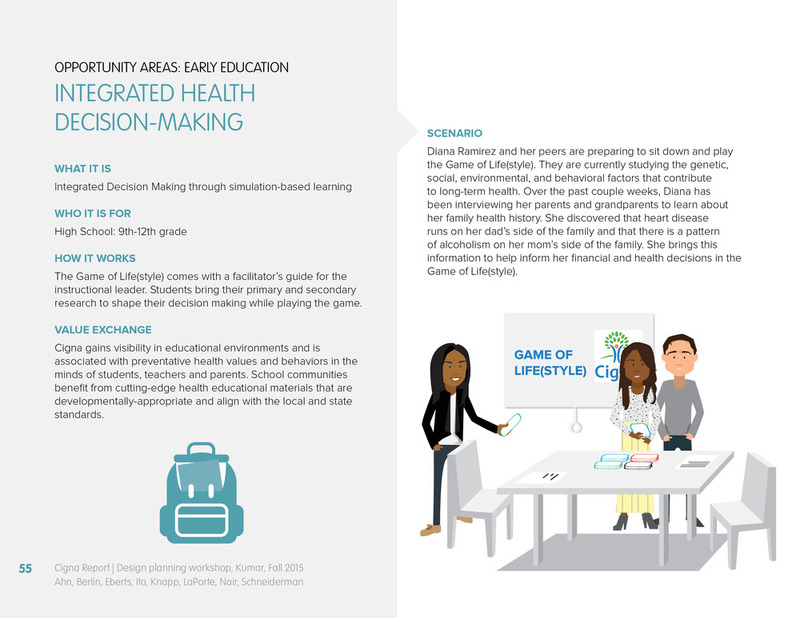 Click through below to see how we envisioned one of these opportunity areas, Early Education. 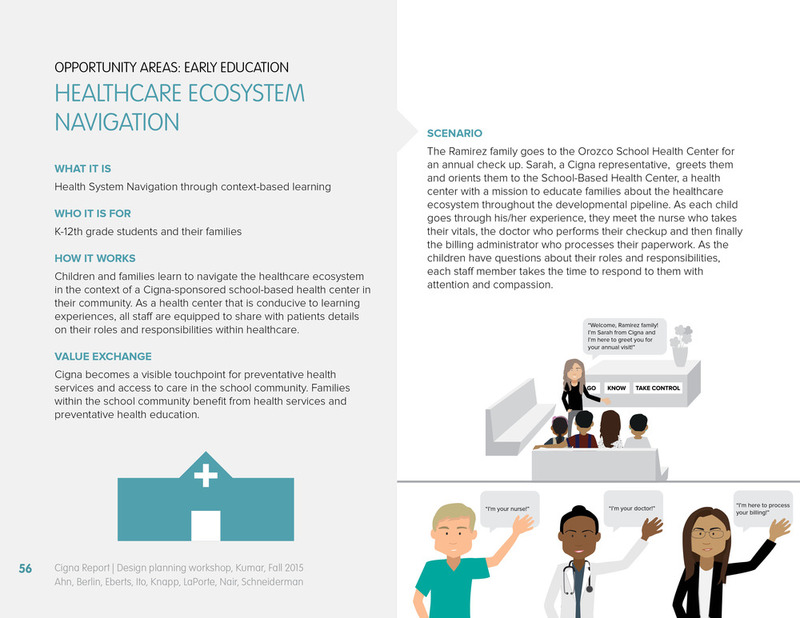 We also suggested a roadmap for each opportunity area to help Cigna think through possible steps toward implementation. Stakeholder map: As part of our contextual research, I helped put together this stakeholder map that especially helped our team understand and communicate the complexity of the healthcare system. By looking at different types of value flows in isolation, we could see interesting patterns. For example, there is a lot of information flowing in this system, however the end users are mostly left out. 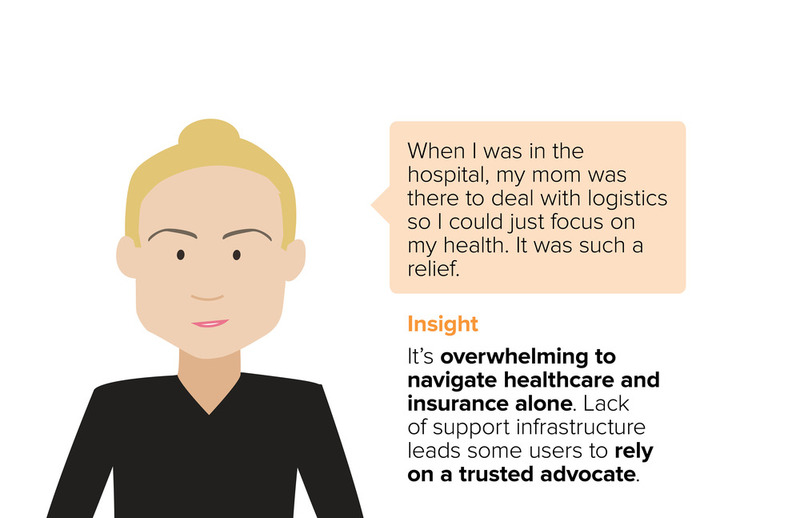 There is only one flow of information between payer-side customer service and the patient. This helped us see that empowering users with information might be an opportunity early on in the process. Primary research: In addition to interviews, we thought doing a card sort activity with some participants would give us an interesting perspective in to their mental model and perceptions of healthcare. I developed the protocol for this activity, which provided a very revealing stimulus for people to share their stories. Analysis process: After each interview, we walked through the interview and developed insights as a team. 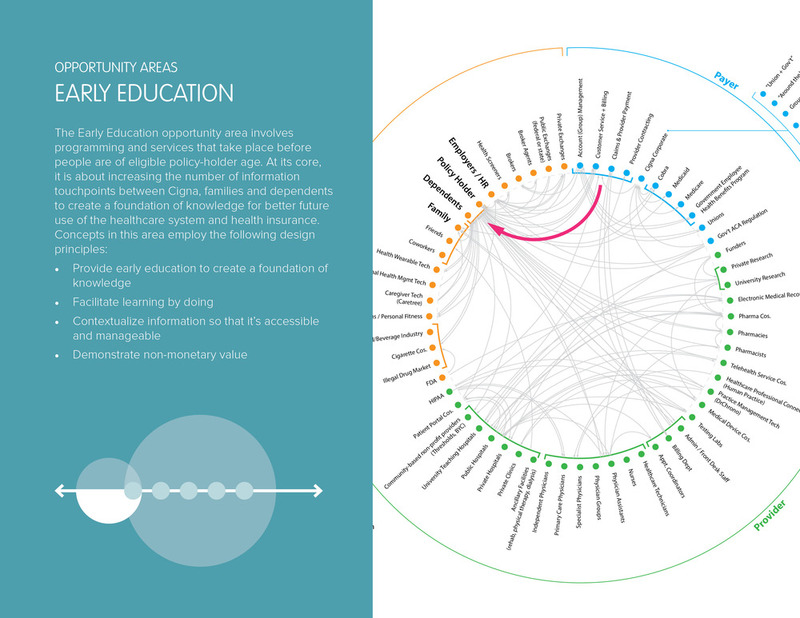 We went through a few rounds of sorting and clustering these insights to summarize our findings in a framework. Ideation workshop: Our team facilitated a workshop with our partners from Cigna and some classmates. Apart from summarizing our insights, I also helped to develop the content for idea generation stimulus, including trends, scenarios, and "how might we" statements. Communication experience: For our final presentation, we wanted our audience to be immersed in our data from the field to get an appreciation for the struggles people have with healthcare. We created an experience room where people appreciated and engaged with the data on their own.